For the past three years, Scott Chasse has seemingly delved deep into an obsession. Producing pixelated paintings by the dozens, the artist has focused the majority of his attention to one subject in particular: Burt Reynolds. When asked about his fixation on the 70's machismo-laden donner of a world famous pre-ironic moustache, Chasse cites inspiration from childhood memories, the absurdity of celebrity, and the questionable resurgence of moustaches in today's fashion trends. 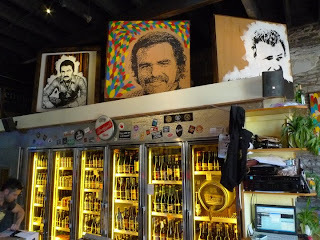 With recent Burt-centric solo exhibits in Philadelphia & Boston, the artist finds himself at the logical next stop for his traveling collection of Burts: a pop-up show at Brouwerij Lane - a specialty beer shop in Brooklyn, NY.